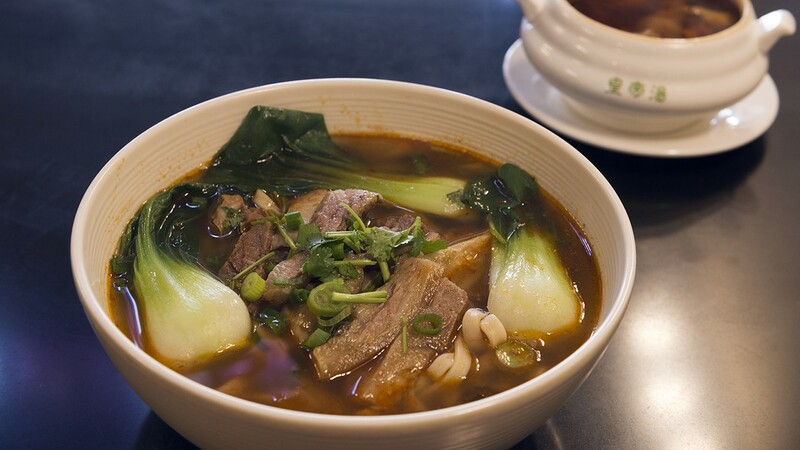 The Oakland Chinatown restaurant serves traditional double-boiled soups and steamed dishes. The chicken soup with ginseng promises to improve liver, beauty care, and body detox efforts. I had never seen deer antler velvet on a restaurant menu until I visited Imperial Soup. Listed as a house special, the English translation only told me that the velvet came in soup form with chicken and herbs, and that was enough to sell me on it. But when I ordered it, the server told me not to — it was specifically for men to increase virility. The one-year-old, Oakland Chinatown restaurant specializes in such double-boiled soups with various healing properties, and it's one of very few in the East Bay to serve them at all. The traditional process isn't actually boiling soup twice; rather, it involves submerging a small ceramic pot into another pot of boiling water — a slower technique that gently coaxes out the flavor of the ingredients into the soup itself. In other words, the hunk of chicken in your pot at Imperial Soup might be bland, but that's because all the goodness is meant for slurping instead. That's most relevant for ingredients you aren't necessarily supposed to eat, such as certain types of bark or fibrous roots. Let's get back those healing properties. In Chinese culture, diet has long been linked to health, in a way that's much more pervasive than in the United States — no matter how popular kale salads get. In the sixth-century BC, founder of Taoism Lao Tzu famously stated, "Medicine and food are from the same source." Imperial Soup, a bright but no-frills spot, is jam-packed for lunch every day of the week not necessarily because of the quality of its Hainan chicken rice or dumplings. It's consistently busy because folks are thrilled that Chinatown, at last, has a destination for health-focused dining. On the menu, the soups are divided up not by flavor or protein but by purported health benefits. There's a section for a healthy liver and beauty. There's a section for lung nourishment. And there's one for kidneys and reinforcing "vital energy." While there are English descriptions related to ingredients, they are brief and not always helpful. There are, for example, three separate soups listed only as "pork with herbs." But the Cantonese descriptions are much more thorough: the first is supposed to smooth your throat and stop coughing with the addition of fish bladder; the second is meant to improve your skin thanks to white fungus; and with certain flowers and nuts, the third promises to cleanse your lungs. I tried four of these medicinal soups and there was a certain calming, revitalizing quality to them — or maybe it was placebo. Flavor-wise, they varied greatly. An oxtail soup with dried plums and tamarind was so subtle that it barely tasted like anything. A chicken soup with black beans and gingko nuts, however, was unctuous, earthy, and soothing. Another chicken soup was far more sweet with the addition of dried scallops, mushrooms, longan fruit, and sea cucumber, fuzzy caterpillars that taste like sea snails. But there were also surprising blasts of salt from chunks of ham. Perhaps the most medicinal-tasting of them all was the chicken soup with thin shards of American ginseng, dried figs, and orange flower buds, a collection that leaned pleasantly bitter. These soups can be ordered alone or as part of a combo meal, which are excellent deals at roughly $10 for a large entrée and a cup of soup. While the rest of the menu doesn't subscribe to a certain region — there's Hong Kong-style curry, Taiwanese beef noodle soup, Shanghai soup dumplings — it does stay consistent with the health theme. Just about everything is steamed, which is widely believed to be the best way to cook food while retaining nutrients. Plus, there's no oil involved. One popular option is rice steamed in lotus leaves, topped with some kind of meat. The rice itself is mixed with chopped-up omelet, carrots, and sometimes beech mushrooms or fake crab as well. The grilled eel — Japanese in style, but without the sweet unagi sauce — gets prettily arranged and hugged by a ring of pickled daikon. A vegetarian option pairs different kinds of mushrooms with squishy bamboo fungus. For a more substantial option, go for the sweet Chinese sausage and fatty Chinese bacon, which is cured with soy sauce, with just-cooked Chinese broccoli lining the perimeter. They were all solid, simple, and well prepared. My favorite entrée was the Taiwanese-style noodle soup, loaded with meltingly braised beef flank, bok choy, and thick egg noodles. Slicked with chili oil, the soup was deliciously beefy and, as with the majority of the restaurant's offerings, not too salty. The curry seafood soup was nice as well, with a zippy yellow curry appropriately imbued with the flavors of shrimp, squid, and fish cakes. The spongey, yellow noodles are also a style you don't see at most Chinese restaurants: yi mein. The dough is made with carbonated water and gets fried and dried before being used. I was less enthused with the Hainan chicken, which is served cold with its golden, gelatinous skin; jiggly, gelatin-like juice; and both dark and light meat. Given the proliferation of restaurants serving excellent khao mun gai (the Thai version of Hainan chicken), the texture of Imperial Soup's chicken just didn't stack up. But the rice, while a bit hard, carried flavor from the chicken stock it was cooked in, and I appreciated the trio of sauces on the side, which included a wonderful mash of scallions and ginger. The xiao long bao also disappointed — big, clunky, and far too doughy, with very little soup tucked inside the dumplings. Perhaps that's all to be expected, though. Of course, the thing to get at Imperial Soup is soup. That extends to the dessert menu, with a series of Chinese sweet soups that are only slightly sweet. Imperial Soup makes a great version of double-layer steamed milk, a velvety smooth custard with a thin skin on top from the cooking process. On the more medicinal end of the spectrum, there's also steaming-hot milk with floating chunks of papaya, which is known to be good for digestion, and slippery, jelly-like peach gum, which is believed to beautify skin.